If you like watching foreign movies, you may find that, when seeking out new films, you can only get the movie you want in a version without subtitles. This is great if you’re bi- or multi-lingual, but if not, you really need to know what the actors are saying. In this article, I’m going to look at subtitles: how you can play them in movies that already contain them, how you can add them to movies you rip from DVDs, and how you can create your own subtitles or captions. Some movies you buy in the iTunes Store come with multiple language tracks and subtitles. You can access these in iTunes by starting to play a movie and then clicking the speech balloon button. From this menu, select the audio or subtitles language (or closed captioning) you want. You can also use iTunes’ Controls > Audio & Subtitles command. On an iOS device, tap the similar button at the bottom of the Videos screen to choose from the same options. Some movies from the iTunes Store come with multiple languages and subtitles. On the Apple TV, these options are hidden. To access them, press and hold the Select button (the center button) on your remote. You’ll see three tabs: Chapters, Subtitles, and Audio. Select the tab you want, then choose your language. If you buy foreign movies on DVD and you get them from the country where they’re produced, they may not have subtitles for English or for another language you speak. If you rip these DVDs (see our guide to ripping DVDs with Handbrake), you can add subtitles to them. First, let’s take a DVD that already has subtitles. In Handbrake, after you’ve chosen your ripping settings, click the Subtitles tab. Under Track, click on the pop-up menu. If subtitles are available, select your language. 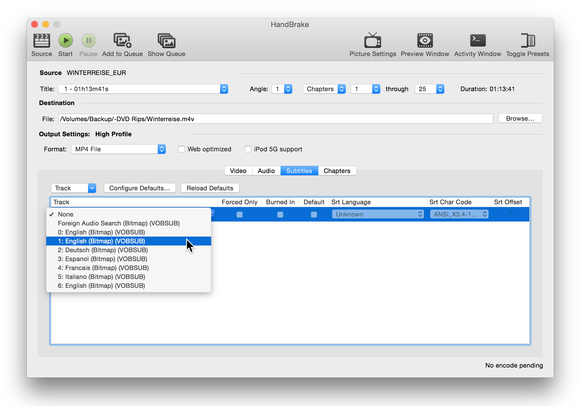 If you’re ripping a DVD that has subtitles, you can have Handbrake add these to your rip. If there are no subtitles, then you need to find them. There are a number of crowd-sourced subtitle repositories you can check, such as opensubtitles.org. Find your movie or TV show and then download the subtitles. These will be in an .srt file. In Handbrake, click the Track pop-up menu in the Subtitles tab and then choose Add External SRT. Select your file, and then click OK. You have three options. Enable Forced Only if your subtitles are for a film that has some sections in a language different from the audio track. For example, in a James Bond movie, when characters are speaking Russian, you’ll see subtitles (unless you’re listening to a Russian audio track). Enable Burned In if you want the subtitles to be permanently planted in the video; in this case, you can never turn them off. Finally, check Default if you want the subtitles to be turned on by default. During playback, in iTunes or on the Apple TV, you can choose the subtitles the same way as I described above, unless, of course, they’re burned in. In this case, they’ll always appear. If you play back the video with other software, such as VLC, choose the Subtitles menu to set subtitles. Subtitles from opensubtitles.org may not be perfect. As I said, these are crowd-sourced, and there may be glitches, or translations that are not as good as what professional translators may provide. But it’s better than nothing. If you want to add subtitles to movies you’ve already ripped, you can do that using Subler (donation requested). This app will allow you to add .srt files to existing videos. An .srt file is simply a text file formatted in a specific way. You can create your own subtitles and add them to your movies, as described above. To do this, you can either use a text editor or a dedicated tool for creating .srt files. Using a text editor is complicated because you need to know the precise time codes. Here’s what .srt files look like. Each subtitle has a number, and its duration on screen is specified by time codes. Time codes are in the format hours:minutes:seconds,milliseconds. Look at me, I’m walking! A great tool for creating and editing .srt files is bin liu’s $10 SRT Edit Pro. This app allows you to see your video and an audio waveform (so you can tell when dialog begins and ends), and lets you insert time codes and subtitles. 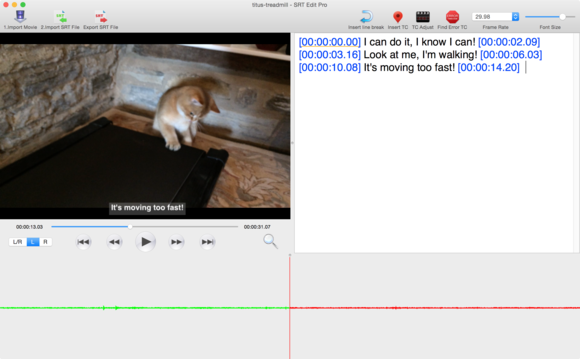 SRT Edit Pro makes it easy to create subtitles for your videos. Find where you want a subtitle to begin and click Insert TC. Type your subtitle after the time code and then, at the location where you want the subtitle to no longer be visible, click Insert TC again. Continue through your video. You can use the audio wave form to show you when dialog begins and ends. It’s best if your subtitles correspond, as much as possible, to the timings of people speaking. You can also use SRT Edit Pro to edit existing .srt files that you’ve downloaded, if you want to make corrections to them. Once you have your .srt file, you can add it to your video with Handbrake, as explained above.